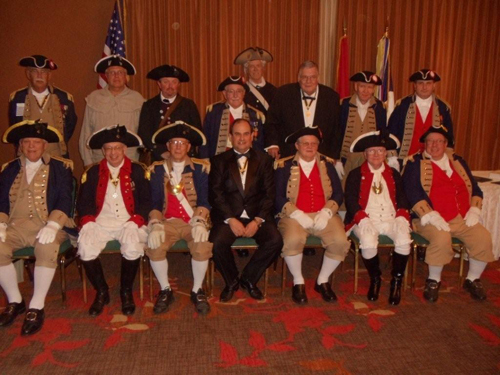 Pictured here is President Clifford Olsen (Outgoing MOSSAR President), President Denis Craft (Incomming MOSSAR President) and Robert L. Grover, MOSSAR Color Guard Commander, along with the MOSSAR Color Guard team at the 121st Annual Missouri State Convention in St. Louis, Missouri on April 29-30, 2011. Photo (Front row) (L-R): Keith Brown, MOSSAR Eastern Color Guard Commander; Russell DeVenney; Western Color Guard Commander; Robert L. Grover, MOSSAR Color Guard Commander; Clifford Olsen (Outgoing MOSSAR President); Gerald McCoy; Southeastern Color Guard Commander; Compatriot Wayne Merrill; and James L. Scott. Photo (Back row) (L-R): Compatriot Charles Lilly; Compatriot Robert Brindell; Compatriot Jonathan Hunt; Compatriot Wilber Kephart; Compatriot Ed Morris; President Denis Craft (Incomming MOSSAR President); Compatriot James Boyd; Compatriot Dirk A. Stapleton.